The villa is perfectly located - 10 minutes walk to town center, 10 minutes drive to 2 beach parks and 15 world class golf courses. Only a 15 minute stroll to Belek town center, our villa is setting within a small secured community of 7 detached villas. Its next to a river and with a view to the majestic Taurus Mountains, providing a tranquil environment for relaxation and entertainment. 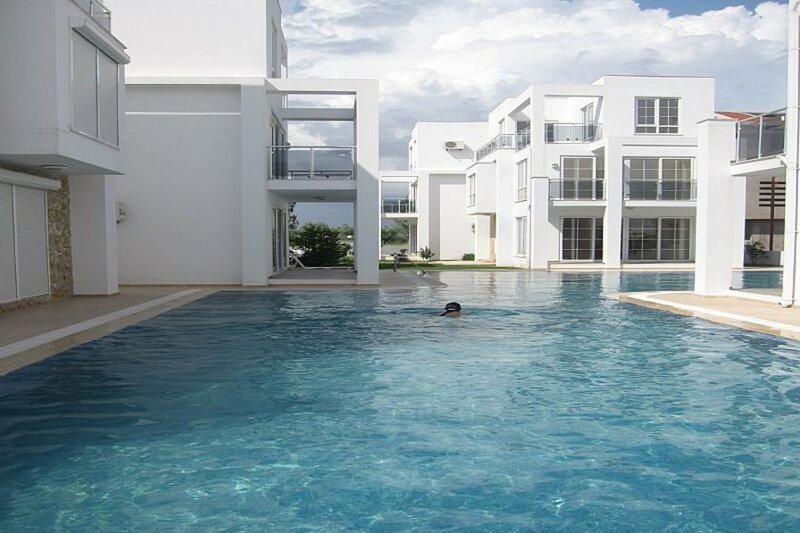 Within its own landscaped garden, there is a huge stunning L-shape communal swimming pool. The villa has floor to ceiling windows/patio doors throughout all three floors, bringing abundance of natural lights. The brightness and airiness is beautifully complemented by the villa’s cream and white interior, sleek black granite counter top and table in the open plan kitchen, cream marble floor throughout kitchen and living room, modern sectional sofa, and white custom made wall unit housing all entertainment devices. Two walls of the living room area are consisting of two glass sliding doors – one leading to the covered patio which extends onto the swimming pool and relaxing area, the other leading to the front yard garden. This beautiful brand new detached villa with ultra modern architectural designs has 3 double bedrooms and a study which accommodates up to 8 people. On the top floor is a master bedroom suite with a study and glass doors open up to a private roof terrace, overlooking the majestic Taurus Mountains, river and town center. The en-suite master bedroom suite is completed with classy minimalist furniture, a study which can turn into a forth bedroom, a Jacuzzi and shower. The villa also has two other double bedrooms and two bathrooms with shower and granite counter top. One of these two bedrooms also has a large balcony overlooking the pool, the river, the Taurus Mountains and the town center. This villa is perfectly located, beautifully designed and furnished throughout with everything that you need to enjoy a relaxing sun drenched holiday in the Turkish Riviera. Located on the Turkish Riviera, the villa is just 25 minutes from Antalya international airport. It is within walking distance to the town center in Belek, which is known for golfing and golden sandy beach. There are15 golf courses and 2 beautiful beach parks within 5-10 minute drive from the villa. Within easy reach, you can find bars, restaurants, water sports, Troy Aqua & Dolphinarium, and a large selection of shops. There are plenty of places to visit or just lounge around our villas huge pool to chill! Within Antalya the must see would be Antalya Archaeological Museum, the Kaleici (the pedestrian only old town which is great to walk around), the elegant Yivli Minaret Mosque and the Hadrian’s Gate. The Minicity is a park your kids would love as it shows many spectacular historical places in Turkey in miniature scale. The famous Aspendos amphitheatre is one of the most well preserved ancient theaters in the world and still in use for operas and other performances. Perge is a huge Roman city where you can follow the footsteps of St. Paul on his way from Jerusalem to Rome. Kursunlu Waterfalls is on the slope of the Taurus Mountains where you can cool off while enjoying the spectacular views. The magnificent Unesco site Hierapolis or Pamukkale (modern name) has amazing formations of stalactites which look like cotton castles hence the name Pamukkale which means cotton castle in Turkish. Gulluk National Park is the ideal place for trekking and yachting activities. The 2,000 years old ancient city of Thermessos is also set inside the park. Our most favourite is a journey driving to Kemer, or Kalkan if you have more time, on the narrow and winding roads along the coast. It awards breath-takings views of the mediterranean sea on one side and lush pine forest on the other. Along the way you will enjoy discovering beautiful local villages and towns such as Beycik and Kas. Our fond memories of the trip exceed that of Amalfi Coast in Italy. Year Round Climate for Golfing, Sunbath & Ski on the Same Day! The Mediterranean Coast & Climate: Over the last few years this part of Turkey has become a popular destination for discerning holidaymakers embracing both the magnificent coastline and the historic importance of a country that for thousands of years has been the connection between the East and the West. The early Roman invasion has left a legacy of historic ruins which add significantly to a visit to this unique country. Antalya, the gateway to the region which is referred to as the ` Turkish Riviera is an attractive city with a prize winning marina and a picturesque old quarter. Perfect climate: The summers are dry and hot averaging max. 34C and winters generally mild averaging 15C in Jan/Feb with possibility of rain. However, these are shade temperatures so bear in mind that it is a lot warmer than this in the sun - and the Antalya region gets plenty of sun. If fact, 300 days of sunshine a year - a perfect place for vacation anytime. Ski: Ski and sunbathe on the same day! For winter guests, skiing is possible at Saklikent in the Bey mountain range, which rises steeply to 3000m behind Antalya. The slopes are ideal for beginners, offer magnificent sea and mountain views, and are just a one-hour drive. The ski resort at Davraz is around two hour drive from Belek and offers longer and more challenging runs. The tallest peak at the resort is 2,637m with the highest skiing height being 2,250m. Davras gets the same levels of snow as most European destinations, but as we all know the snow cannot be guaranteed - the most promising being January to March when the snow is at its best. Golf: Discover the joy of year round golfing in Belek. With 15 magnificent golf courses including designs by stars such as Nick Faldo and Colin Montgomerie, Belek is gaining an army of admirers as it rivals Portugal and Spain as THE place to play golf in Europe. The golf courses are set between the majestic Taurus mountains and the Mediterranean Sea. They also have first class practice facilities and clubhouses whose attentive staffs take care of visitors from the moment of arrival. The 7 stunning championship courses are second to none - The National and Gloria Old are the best known but Pasha, Sultan, Nobilis and Tat Beach all stand up to close scrutiny. And they are all within 10-minutes drive from our villa. You are spoilt for choice on booking a fantastic golf holiday! Booking 15 golf courses at affordable prices all in one place, we could point you to the right direction. Big L-shape swimming pool is wonderfully illuminated in the evening for your enjoyment of a night dip. Please note pool is open from June to September.